After a sold-out, two-night showcase in 2017, Theater Director Chari Arespacochaga and original story creator Professor Setsu Shigematsu are once again leading the adaptation from its original children’s book form into a live theater musical, with co-director Winter Lawson and book writer and lyricist, Maggie Herskowitz ("Loch Lomond", "Musical Chairs", and “Invincible"). This year's showcase includes music and lyrics by composer and actress Jacqueline Emerson (“Hunger Games”), and musical arranger Lee Huff (“Stranger Things: A Musical”). 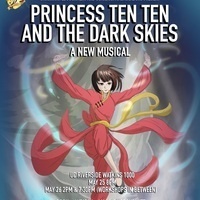 Princess Ten Ten and the Dark Skies pushes the boundaries of musical theater for audiences of all ages. Ten Ten is a coming-of-age story of a girl who is bullied and rejected by her father because she does not conform to the gender norms of her society. Theater professionals and environmental scientists alike have collaborated on the project to create an innovative musical showcase that addresses gender-based bullying and air pollution. The story was the first of the Guardian Princess books, a series and organization created by Setsu Shigematsu that’s quickly transforming the cultural meaning of princesses and princes into positive role models who reflect greater racial, cultural, and gender inclusivity. Learn more about the Guardian Princesses, here.